The post on the Irma Thomas concert at the Sage in Newcastle Upon Tyne is in my head begging to come out, so I will write about the next-to-last big event of my trip first...well not quite first...I had to get the whine out of the way. 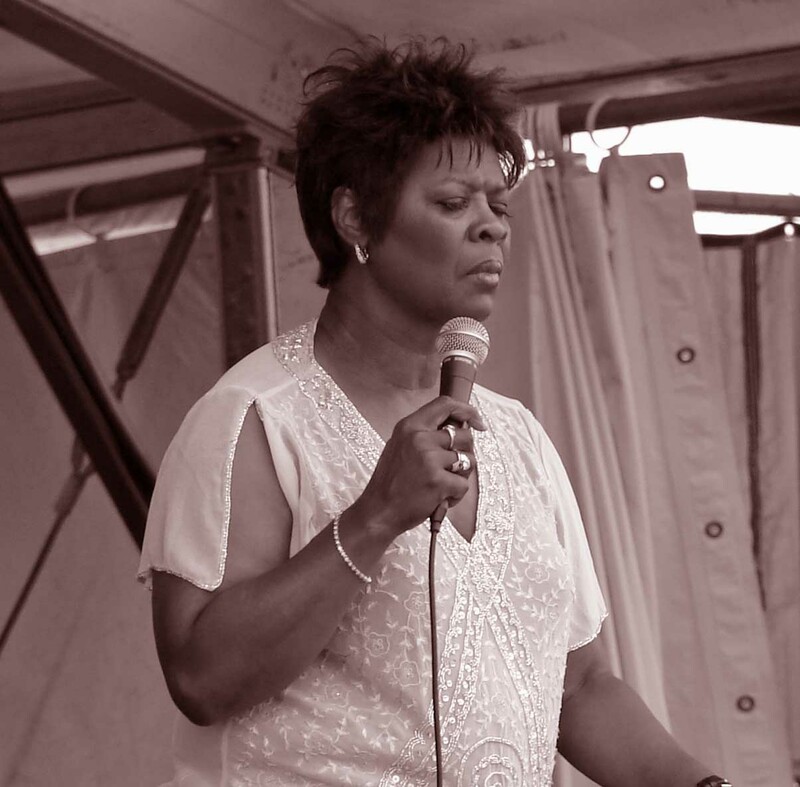 People thought I was crazy to go to an Irma Thomas concert in Newcastle, when she performs in New Orleans upon Mississippi quite often, but I thought it would be cool to hear the Soul Queen of New Orleans in England and to see the audience reaction over there. MadPriest accompanied me, or rather he drove me in his car. And it was beyond cool. I made no mistake. Before Irma took the stage, a 'Gospel choir' performed. As the choir came onto the stage, my first, shocked thought was, "They're WHITE!" All right, they were fronting for the Soul Queen, and I expected a black Gospel choir. Silly me. Still, the all-white choir seemed to thoroughly enjoy themselves singing soul and blues music. Next up was the Soul Rebels Brass Band out of New Orleans, and they were excellent. Now we're groovin'! I probably lost a good portion of the little hearing that I have left listening to them, but it was worth it. Then comes the Divine Irma. I did not know her age at the time of the concert, but I thought she was at least 10 years younger than I, but Thomas is 70 years old! Only 6 years younger, and what energy! And she was off to London to perform at the Barbican Centre the very next day. Irma and her band put their whole hearts and souls into their performances. She loves her audiences and spends herself for them, and the folks in Newcastle returned her love in abundance. She had her cheat sheets along, her binder with the lyrics of all the songs she's ever recorded, and she took requests from the audience and sang as many of the requests as could be fit into the time. To see the interactions amongst Irma and the members of her band is amazing. They're together as a team in a smooth flow that is a joy to witness. When I hear soul music with a dancin' beat, it's really hard for me to sit still in a seat, so I was thrilled when the folks in front of me stood up, and I could stand and MOVE in time to the music. I passed a good time; I did. Earlier in the day, I asked MadPriest if he had a white handkerchief I could borrow. I meant to bring one of Grandpère's with me, but I forgot. When MadPriest asked what I wanted with the handkerchief, I told him that around these parts, it is customary to stand up and wave a white handkerchief in time to a song with a fast beat when Irma performs. He said, "You won't; not with me." Heh, heh. I forgot all about the handkerchief, but I had white tissues. At some point, I got out my tissue and began to wave it. I didn't care if MP was embarrassed. I was gonna do it. I HAD to do it. MadPriest said the bass player gave me a thumbs-up, but I missed seeing it. :-( Later in the show, a member of the audience asked for the "handkerchief song", and Irma passed out tissues to the audience to wave as she sang, and I was no longer alone. Irma's is a niche fan base, but the fans love her, and they are loyal. It's great to see performers give their best and to see the audience respond with love. To you folks who thought I was crazy, I knew what I was doing, and I received my reward. MadPriest, whose standards are high, said it was a wonderful show. Below is a note to her fans from Irma's website, linked above, which shows that she never forgets them and their part in her success. This year started on a very good note and turned into a great one! Work has been steady, and the awards just keep on coming. I received an Offbeat Award, A Blues Music Award, Big Easy Award, a Family Services Award (for my Husband and me), The Mo Jo Magazine of London England Legends Award, and the year is not over. I am so blessed. You the fans have caused me to be in this position and I want to thank all of you for your dedication and loyalty. Without it I could not survive. To know you have loyal fans all over the would is a humbling experience to say the least. One can not take for granted, not one of you, and I hope I never ever do that in this lifetime. Just wanting to say thank you again and looking forward to seeing and singing for you in the coming months. Look for my new CD, "50th Anniversary Collection" - all the greats! UPDATE: A review of her performance in Newcastle may be found in JournalAlive. Irma was in excellent form at the Barbican in London according to the review in The Independent. Oh, I love this report! What a great post. Thanks, Grandmère Mimi, and thanks for waving the handkerchief :-). MP will get over it. Jane, thank you. This one is close to my heart. What a super post! Now I must find myself some more of her music to listen to. He said, "You won't; not with me." Heh, heh. I forgot all about the handkerchief, but I had white tissues. At some point, I got out my tissue and began to wave it. I didn't care if MP was embarrassed. I was gonna do it. Glad you and Cantankerous @rse had such a Bon Temps! Another local custom is clapping on the offbeat. I wonder if the English know to do that? Ormonde, the folks there were, for the most part, true-blue fans of Irma. They knew her songs and her ways. Anyway, Irma show the crowd how to do it. On Sunday, the Savoy Family Cajun Band performed on the outdoor stage, and I was amazed at the number of folks in the audience who went to the dance floor to do the Cajun two-step. So.... when the tissues were handed out --did MP relent and join in? Curious minds want to know! Oh noooo, margaret. MP did not join in with a waving hankie. Pity.... did he stand up and groove --for at least a minute? I hope so! MP stood up. I was looking at the stage, but I don't think he grooved. Loves me some Soul Rebels! What a thrill it must have been to see them with the fabulous Miss Thomas while in England and with MP, to boot. What a fortunate country to be visited by three such cultural powerhouses from Louisiana at the same time! annski, I was thrilled to be at the Sage to hear musicians from New Orleans, and MP was a good companion for the show. I was afraid to glance his way in my wilder moments, because I did not want to see his embarrassment. However, there's only so much you can do when you're squeezed between seats. Me a cultural powerhouse? Thank you. I blush.